I had the honour & joy to attend a reunion of people from the church we went to until I was almost 9 years old. We met in a park, in the town I was born in – Richland, Washington. It was amazing to see these people who had influenced my early life. It was also a bit overhwhelming – trying to put names to faces, trying to get round to talk to everyone (I failed miserably at this) & running around after my boys. It was so good though. The highlight for me was spending almost 4 hours with my sister, my best friend from those days & her sister sitting in a Shari’s restaurant – talking & laughing. Catching up on so many years apart, remembering events, telling stories. We laughed so much. The stories! I can’t relate them here – I must protect the guilty. There is something about a shared history that creates a bond. My family travelled & moved alot over the years so we have friends around the world & I love that. We sacrificed security & some life-long relationships to move & travel as we did. That’s tough sometimes. Spending time with those three amazing women felt like a gift & I am so grateful to have had that time together. I certainly pray that there will be more times like it despite the distance that seperates us. Here’s a picture of me & my best friend as children. 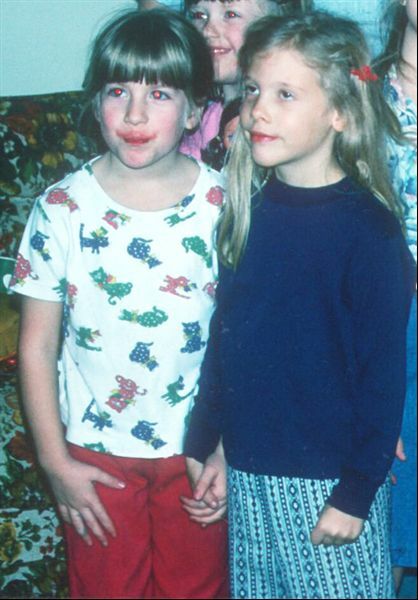 Note the hand holding & the lovely kool-aid face that I am sporting. Categories: Life & Times | Tags: friends, friendship | Permalink.